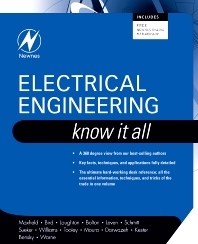 Electrical engineers need to master a wide area of topics to excel. The Electrical Engineering Know It All covers every angle including Real-World Signals and Systems, Electromagnetics, and Power systems. Tim Williams worked for a variety of companies as an electronic design engineer, before startinghis own consultancy specializing in EMC design and test advice and training. He has monitored the progress of the EMC Directive and its associated standards since it was first made public, over the last 25 years. Alan Bensky, MScEE, an electronics engineering consultant with over 25 years of experience in analog and digital design, management, and marketing. Specializing in wireless circuits and systems, Bensky has carried out projects for varied military and consumer applications. He is the author of Short-range Wireless Communication, Second Edition, published by Elsevier, 2004, and has written several articles in international and local publications. He has taught courses and gives lectures on radio engineering topics. Bensky is a senior member of IEEE.